Contributing​ Style Writer. Follow— Twitter & Instagram. Tyler, the Creator has been slowly building his empire over the past few years. While the rapper originally created clothing under the Odd Future name, he has since branched out with his own Golf Wang label and hasn’t looked back. The multi-talented musician has managed to translate his trademark style into his brand in the form of bright colors and clever branding. Saturday night, Golf Wang put on its first fashion show as part of MADE Fashion Week in L.A. 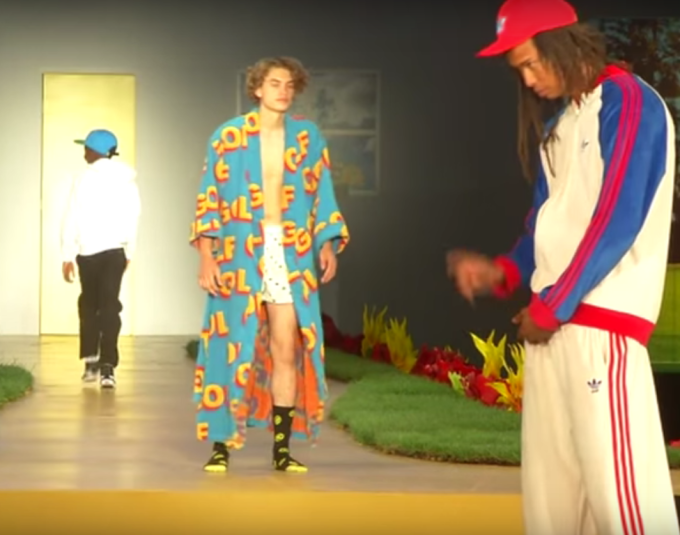 The show went exactly how one would expect a Tyler, the Creator fashion show to go. The presentation wasn&apos;t just limited to models walking down the runway—it also included skits, a live musical performance, and so much more. In the middle of the show, Tyler the Creator took to the stage to perform a brand new song reportedly titled "Ego." You can listen to that song below. In true Odd Future fashion, there was a skate ramp in the middle of the stage. Kanye West and Kendall Jenner were also in attendance to show their support. Not bad for the young rapper to get a co-sign from the style icon. Tyler also seemed to unveil pieces from a possible adidas collaboration. You can see them pop up right before the 30-minute mark in a video of the full show below. Lastly, Tyler the Creator announced he would be releasing his own line of sneakers called "Golf Le Fleur." He also gave out a free pair of shoes to everyone in audience. Despite not really receiving the credit he deserves from the world of fashion, this show was proof that Tyler, the Creator can hang with the best of them, and is here to stay. Tyler, clearly a fan of the "see now, buy now" system that&apos;s been trending in the industry has made all the clothes from the collection available for pre-order.